The 5 Watt LED GU10 Light Bulb range from Crompton benefit from a longer life than conventional halogen bulbs and are ideal for homes, hotels, hospitals and restaurants. This high power bulb is available in three colour temperatures: Cool White, Warm White and Daylight White. 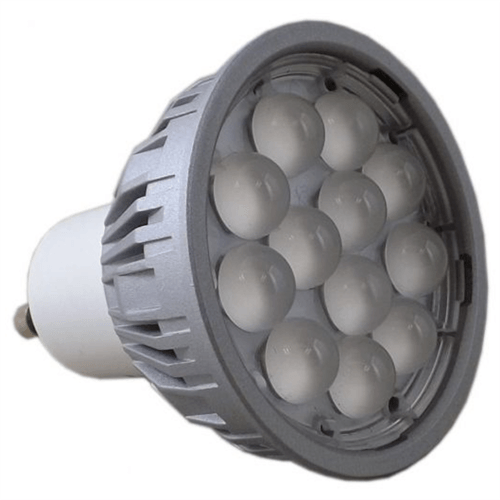 Measuring 54mm in height with a 50mm diameter, the 5 Watt LED GU10 bulb is the same size of the standard halogen 50w lamps, enabling fitting in any GU10 light fitting. With a 30,000 hour average life and are A+ rating for energy efficiency, these bulbs are ideal for saving you money. Please see our Energy Savings Calculator to see your payback period for this lamp.